Technology seduces us like a Medusa whilst we turn to stone pedagogically. Last week I attended the 2015 NACADA International Conference hosted by The University of Melbourne and the theme of the conference was “Partnering for Student Success”. The conference was an opportunity to present a paper on other aspects of Blackboard products and services (Student Lifecycle Services, myEdu and Transact) that impact on the student experience at Higher Education (HE) institutions. When we look at what students expect from their HE experience we find that excellence in teaching and supervision is at the core but other factors include preparation for a job/career; a sense of attachment and kinship with their learning community; a highly mobile experience, accessible anywhere/anytime and technology and facilities that simply work all the time. 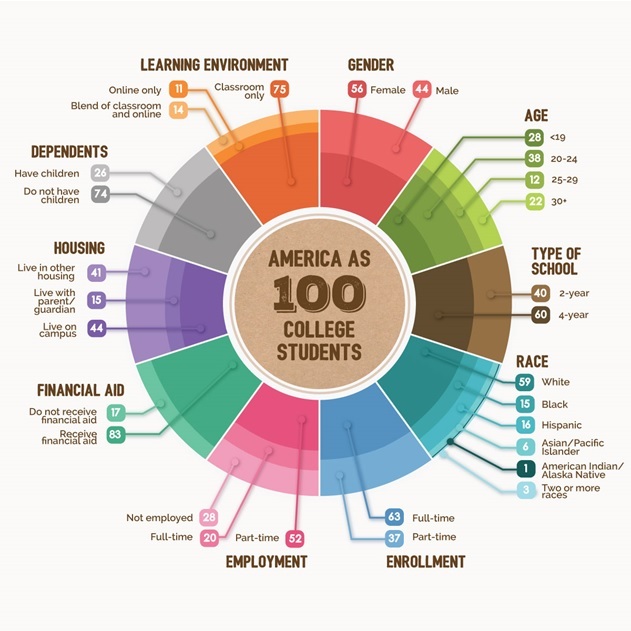 This broad ecosystem has become increasingly important for student success as HE institutions are operating in an increasingly competitive environment with diminishing resources against a backdrop of the massification of HE (see fig. 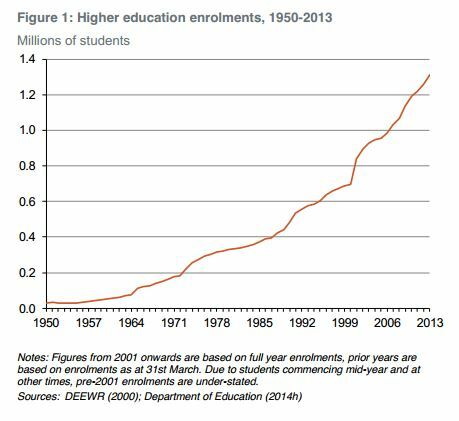 1 – Australia) and the new norm of the non-traditional student enrolled in HE (see fig. 2 – USA) in western countries. To support this broad ecosystem, Blackboard has products and services that extend beyond the Learn/Moodlerooms LMS’s and associated applications such as Collaborate, Learning Analytics and Mobile. This includes a range of professional services supported by custom software solutions to reduce barriers for students during their HE experience from their enrolment through all their support needs (by providing a virtual 365/24/7 one-stop-shop with access to a “single source of truth”) to graduation by providing a service as either a replacement for, or supplement to, the institution’s on-campus resources. 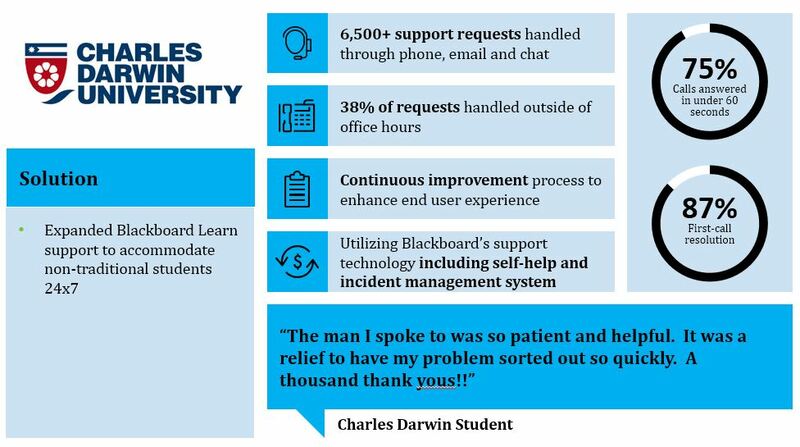 In Australia, Charles Darwin University (CDU) is our first client using ‘Student LifeCycle Services’ and initially it is for the provision of support for the Blackboard Learn application. This is an interesting application particularly with the increasing emphasis on work-integrated learning, ‘job ready’ graduates and employability in a highly competitive job market. The core goal of myEdu is helping young people to manage their academic careers in a way that improves their chances of getting a job – plain and simple. This has been very successful in the United States and we’re now looking to localise this product for the Australian marketplace (if you’re from an Australian HE institution and you’re interested in partnering with Blackboard I’d love to hear from you!). This includes a comprehensive suite of commerce and security solutions built for HE and has been serving the North American HE sector for over 20 years and today there are over 1,000 clients with more than 6.5M electronic student ID’s issued, more than 9.7B student purchase transactions processed annually, and more than 5.0B door access authentications annually. Again, this is a product that has been brought to Australia in 2015 and The University of Sydney is our first client. The aim is to make campus life enjoyable and secure for all students and staff through the use of a credentialing system that can include the use of contactless NFC technology in today’s smartphones. 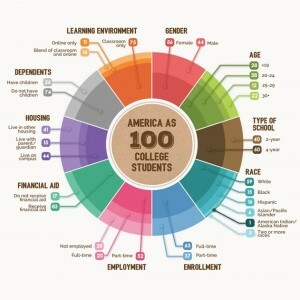 It is a truism that student retention, success, development and engagement are affected by many factors and HE institutions are able to influence some of these in the complex ecosystem that is the Student Experience. Blackboard recognises that this extends beyond the traditional LMS and through products and services mentioned above is able to partner with institutions to attract, enrol and welcome new students, to help in them staying and finding meaningful careers and be references for future students. This entry was posted in Uncategorized on June 28, 2015 by Allan. Technological revolution that is challenging higher education’s business model. The first two points are clearly supported by the recent excellent report authored by Andrew Norton from the Grattan Institute – http://grattan.edu.au/wp-content/uploads/2014/10/816-mapping-higher-education-20141.pdf – and much of the following is extracted from this report. 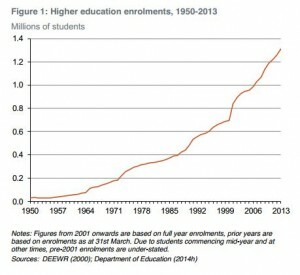 In 2013 the revenues of Australia’s 40 full universities (includes Torrens University Australia), and about 130 other higher education providers exceeded $27 billion and it is interesting (scary) to see the huge importance of international student enrolments as they contributed approximately $5.1 billion of this revenue. Despite significant efforts to diversify their funding base, about 60 per cent of the university cash flow is from government grants or loans and even without deregulation student debt is growing quickly. In mid-2013, HELP debtors owed the Commonwealth $30 billion, with $7 billion likely to be written off as a bad debt, however, just 12 months later this figure had increased to $34 billion, with $8.2 billion likely to be written off as bad debt. This is unsustainable and I fear that with the likelihood of the Pyne Package MkII not passing the Senate this will mean the Federal Government will look to cut Higher Education costs with no offsets for the sector. increased casualisation of academic teaching staff as universities strive to manage their cost of educational delivery. This is certainly not an exhaustive list but is meant to illustrate the changing macro environment in which educational technology companies such as Blackboard are working and helps to guide what combination of products, services and consulting can best assist the strategic direction of the university as it seeks to succeed in an increasingly competitive sector. This entry was posted in Uncategorized on February 12, 2015 by Allan. In 2013 Edutechnica published a blog entitled “Data-driven Campus LMS Strategy” and included Australian universities identified from the Australian Open Data site. At the time I responded in the comments section that I thought the results for Australia were flawed and a better data set to use was http://education.gov.au/selected-higher-education-statistics-2013-student-data but I see that the ‘Comments’ section is closed and this criticism was not published. Now that Edutechnica have again analysed LMS usage in Australia (and other countries) using the “same set of institutions used in 2013 to keep this data uniform” it has prompted me to write this blog to correct the record about LMS usage in the Australian universities. Put simply, it is generally accepted that there are 39 universities (38 public, 1 private) in Australia. 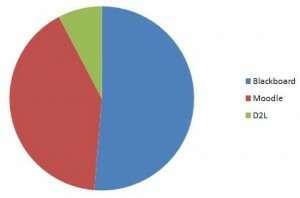 Given the small number of universities and my knowledge of the sector I know that there are 20 (51%) universities which use Blackboard as their enterprise LMS, 16 (41%) use Moodle, and 3 (8%) use D2L. It is acknowledged that there are some departments within universities that use another LMS but according to Edutechnica’s methodology these were excluded from their analysis. In terms of EFTSL (Equivalent Full-Time Student Load) in 2013 the distribution of LMS usage in Australian universities is 475,676 (53.65%) Blackboard, 340,064 (38.35%) Moodle, and 70,890 (8%) D2L. [Source: Australian Government Department of Education]. The reference to the Sakai usage in 2014 and not in 2013 is interesting in that Charles Sturt University (CSU) was the only university in Australia using Sakai until they made a decision in 2013 to move to Blackboard. I can’t explain why this wasn’t shown in the 2013 data and in 2014 this would represent a legacy LMS as CSU is well advanced in their transition to Blackboard. So what is the point of this critique? Firstly, it is very easy in today’s connected world for information to be promulgated without critical review – I know I fall into this trap daily with retweets! Secondly, the work of Edutechnica to automate the capture of LMS usage data is good in principle but it must still be seen as a “work in progress” as demonstrated by their results for the Australian university sector. If we want to consider all HE providers (including universities) in Australia then a definitive list is available from TEQSA at http://www.teqsa.gov.au/national-register/search/provider. This lists 176 registered HE providers at time of access (25-Sep-2014). The Australian Government Department of Education at http://docs.education.gov.au/system/files/doc/other/2013listofinstitutions.xls also provides a list of HE providers for 2013 but only lists 133 registered HE providers. The interesting point to note from this spreadsheet is that the 39 universities referenced above account for 94% of the total number of students attending Australian HE institutions as listed. This entry was posted in Uncategorized on September 25, 2014 by Allan. To MOOC or not to MOOC, that is the question! With apologies to Shakespeare’s Hamlet, the question is straight-forward but as it is so often with Education the answer is not. Much has been written of the rise and demise of MOOCs (Massive Open Online Courses). In 2012 there was the surge of venture capital flowing into MOOC startups, Udacity and Coursera, with the CEO (Sebastion Thrun) of the former stating that in 50 years’ time there might be only 10 universities as we know them today. That got everyone’s attention! Then in 2013, there was the high-profile failure of the SFSU joint project with Udacity, the reported high attrition rates and the MOOC providers looking for a sustainable business model built on freely available courses delivered at scale. Certainly MOOCs have been a huge headline and whether they are here to stay or not, they have created an enormous amount of discussion and thinking about online education at the highest levels in our universities. This can only be a good thing as long as decision makers are properly advised as to the applicability of MOOCs in an educational environment in which “one size doesn’t fit all”. On the continuum of technology facilitated learning approaches, MOOCs have a role but it is one that is additive rather than disruptive to existing approaches to both online and traditional face-to-face tuition. Open access: to broaden access to educational content and help teach the world. Helping the movement to make education truly global. Experimentation: this to me is the most exciting. People using MOOCs to experiment and conduct research on the online learning experience to inform the future. Marketing: institutions that are looking to MOOCs as an opportunity to give a free introduction to what their brand stands for by showcasing courses and/or faculty. We thought heavily about these 3 drivers when we decided how to best support this continuing trend in education and I’m excited to share that we are providing free of charge to Blackboard clients, a MOOC/Open Education platform to support all of these purposes – and others as they emerge. Now what will you get from a Blackboard MOOC Platform? A Platform you know – one that your faculty is already familiar with so that you can build your MOOCs efficiently. And one from which successful experiments can be easily converted to your core learning platform. You are going to get the best of current and next generation learning and teaching tools – the results of all of the acceleration, integration and innovation. You will get the ability to easily bridge your MOOC and enterprise platform in key areas such as content and social. And you will get a fully supported platform, ready to scale as you do. As partners in shaping the future vision of education, we want to make sure you as a client of Blackboard have a free integrated platform where you can experiment, innovate, and make a global impact through education no matter what the goals of your MOOC initiative may be. You can see more information about our approach to MOOCs including release dates in my recent presentation – http://www.slideshare.net/BlackboardInc/to-mooc-or-not-to-mooc-creating-a-successful-open-education-model-across-asean-countries. This entry was posted in Uncategorized on May 20, 2014 by Allan. Wow, I can’t believe it’s being nearly a month since my first post! In discussing what it means to ‘Stay Ahead of the Higher Education Curve’ in Australia I wanted to focus on the macro factors that impact the adoption of technology facilitated teaching and learning. Common issues such as the challenges around technology, increasing scale, open access, MOOCs etc. Finding a business model and positioning Australian institutions in this arena. Casualisation of the academic work-force is the itch I have to scratch! Much is written about the importance of the ‘student experience’ in higher education and much investment has been made in technology in a bid to enhance this. However, with casual staff now carrying more than half the load in undergraduate teaching what are the strategies that are in place to ensure these contingent staff are getting the professional development and support to effectively design and deliver technology facilitated courses? We regularly undertake a health check of an institution’s LMS system but rarely are we asked to perform a health check of an institution’s LMS adoption. IMO both are needed to better realise the investment made in technology facilitated teaching and learning. This entry was posted in Uncategorized on April 14, 2014 by Allan. Today is quite an auspicious day for me. I’ve made my first tentative steps into the world of blogging – please be gentle as I find my feet! It also happens to be exactly two years to the day that NetSpot (the company I set up whilst an academic at the University of South Australia in 1998) was acquired by Blackboard. It was a life-changing event for my family and me and, two years later, I’m proud to be the General Manager of Blackboard, ANZ and leading a fantastic team of over 80 staff in the region. Quite a few people have asked me why I’m still working. It’s true that I’m in the fortunate position that I don’t have to work but I’m passionate about elearning and the nexus between academia and business; how we can better understand each other’s needs with the shared vision of appropriate and effective use of technology in teaching and learning in a macro environment that is ever-changing and ever-challenging. … and besides I’m sure I’m too young to retire! This entry was posted in Uncategorized on March 19, 2014 by Allan. Mark Drechsler on Happy Anniversary!